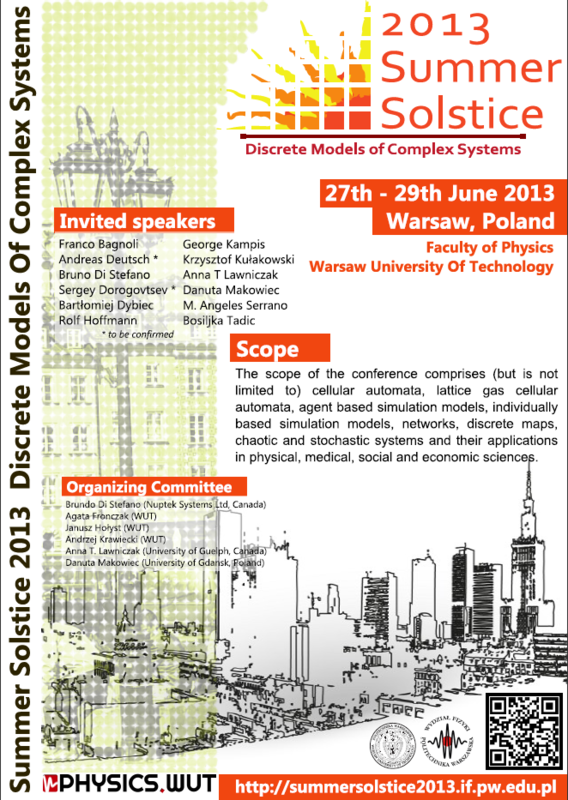 Proceedings of the 2013 Summer Solstice International Conference on Discrete Models of Complex Systems will be published in Acta Physica Polonica B Proceedings Supplement in 2014. All participants are encouraged to submit their contributions to the conference proceedings. The extended deadline for submission is 15 November 2013 . All submissions will go through a peer-review process according to the journal standards. All photos from th econference gathered up until now are available at http://s917.photobucket.com/user/summersolstice2013/library/SummerSolstice2013%20photos?sort=3&page=1. If you have photos made by yourself and are willing to share - please send them to summersolstice2013@if.p.w.edu.pl. Participants who present posters are encouraged to advertise their contributions during the pre-poster session (Thursday, June 27, 16.40-17.00). Presentations should be brief (c.a. 3 min) and consist of no more than 3 slides/transparencies. Here you can download the Summer Solstice 2013 conference programme. On Friday, June 28, at 14:00 a guided tour to the Royal Castle and Warsaw Old Town will be organized. The visit to the Castle is scheduled at 15:00 and will take approximately 1,5 hours. Then, there will be a short walk to the Cathedral and the Old Market and some free time to relax, buy souvenirs, etc. The participants who intend to take part in the excursion will be asked to confirm this at the registration desk. The conference dinner will start at 19:00 after the excursion. Complex systems are pervasive in many fields of science and we encounter them everyday and everywhere in our life. Their examples include financial markets, highway transportation networks, telecommunication networks, human economies, social networks, immunological systems, living organisms, ant colonies, ect. The key feature of a complex system is that it is composed of large number of interconnected and interacting entities exhibiting much richer dynamical properties on global scale than they could be inferred from the properties and behaviors of its individual entities. Complex systems are studied in many areas of natural sciences, social sciences, engineering and mathematical sciences. An important part of these interdisciplinary studies forms discrete modeling. These models can be seen as the simplest laboratories to study phenomena exhibited by complex systems like self-organization processes, pattern formation, cooperation, adaptation, competition, attractors, or multi-scaling phenomena. The objective of this conference is to bring together researchers working on discrete modeling of complex systems and to provide a forum for exchange of ideas and presentation of results of their research. Researchers and scientists working in the area of discrete modeling of complex systems are invited to participate in the conference and present results of their research. Both theoretical and applied research is of interest. 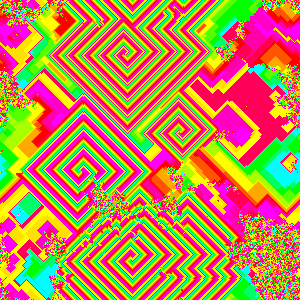 In particular, the scope of the conference comprises (but is not limited to) cellular automata, lattice gas cellular automata, agent based simulation models, individually based simulation models, networks, discrete maps, chaotic and stochastic systems and their applications in physical, medical, social and economic sciences. The conference will be held at the Faculty of Physics, Warsaw University of Technology, Warsaw, Poland. According to a preliminary schedule, the conference will start on Thursday, 27 June 2013 at 9:00, and end on Saturday, 29 June 2013, before lunch.